On 7 November 1899, Ellen, aged 26, married George Alfred Bruce, aged 31, son of James Bruce, in the residence of Rev J J Darwin in North Adelaide, South Australia . 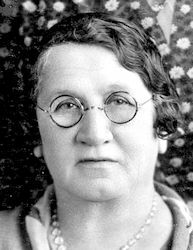 She died on Wednesday, 30 April 1947, aged 74 years and 17 days, in Magill, South Australia , Prior to going to hospital, she had lived in Glenelg. On 8 June 1914, Florence, aged 35, married William Shakel Davidson, aged 31, son of Patrick Davidson and Emily Shakel, in St Peter's Church in Glenelg, South Australia . She died on Saturday, 27 March 1948, aged 69 years, 1 month and 10 days, in Hospital, Glenelg, South Australia . On 11 January 1916, Mabel, aged 32, married Clarence Jeffrey Scarce, aged 21, son of John Scarce and Eliza Carter, in the residence of Rev G Davidson in Rose Park, South Australia . George Alfred Bruce was born on 14 August 1868 in Glenelg, South Australia , son of James Bruce. On 7 November 1899, George, aged 31, married Ellen Ann Stephenson, aged 26, daughter of Albert Stephenson and Margaret Griffin, in the residence of Rev J J Darwin in North Adelaide, South Australia . He died on Sunday, 19 November 1939, aged 71 years, 3 months and 5 days, in Glenelg, South Australia .